Ever needed a bulb that you needed to stay turned on 24 hours a day, even if the power went out? Neither have I, but I can envision some scenarios where that might be important. A dark corridor connecting subway platforms, perhaps? The good news: Feit’s latest LED bulb offers a potential solution. After an initial 24-hour charge, the internal battery is rated to provide 3 hours of backup time. Feit suggests the light be left on for at least 10 hours per week to keep the battery fully charged. Compared to a standard size bulb, the Feit Battery Backup reveals its extreme size. In my testing, the bulb worked a bit erratically, but mostly as expected. In a lamp, the bulb turned off and on normally at the switch, but physically unplugging the lamp did not cause the battery to engage. When I cut the power at the breaker, the lamp did reactivate. On the other hand, when I tried the bulb in a hardwired wall fixture, simply turning the light off at the switch caused the battery backup to engage. In fact, in the wall fixture, no matter what I did there was no way to turn the bulb off. Feit recommends using the bulb in a lamp setting (and that’s indeed where it works the best), but it would be nice if the bulb was more consistent in operation. Also worth noting: The bulb did not work with an external dimmer. Total running time while on battery exceeded the promised 3 hours, stretching to well over 5 hours in my testing. 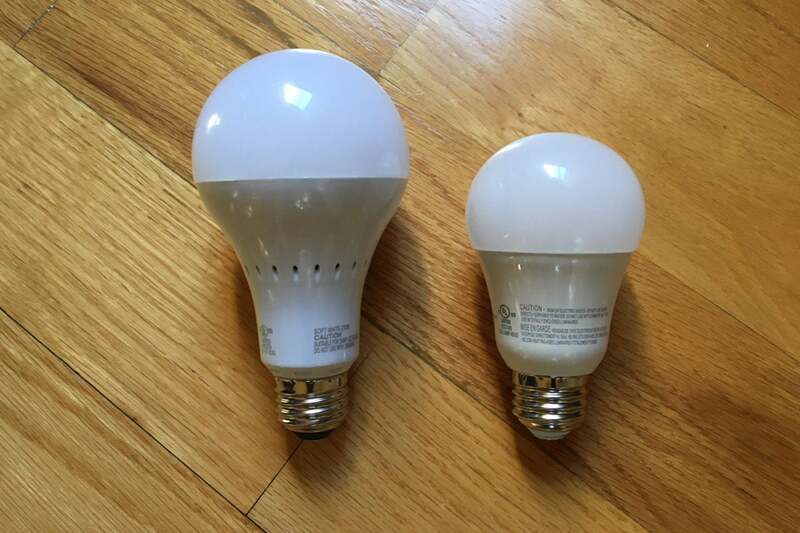 Physically, the bulb is shaped like a standard Edison bulb, but it’s considerably larger than normal (probably to accommodate the battery). It was a tight fit in my test lamp; others may find it requires disassembling a lamp to get it to fit. 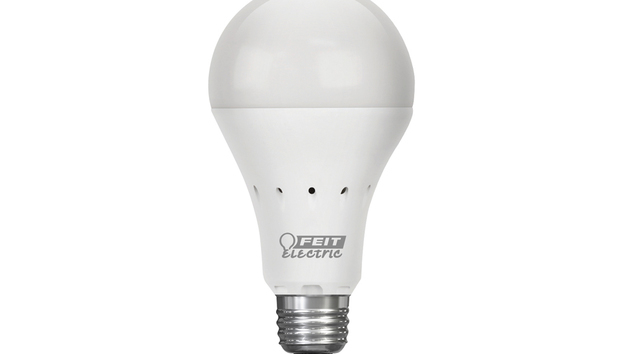 As with other bulbs in the Feit IntelliBulb series, this one does not feature anything in the way of smart controls or wireless connectivity. In fact, there’s not even a way to tell whether the battery has been charged—though of course an indicator like that would raise the cost of the bulb. Pre-tuned to 2700K, the light is warm and inviting, but the brightness is weak. At just 600 lumens, it’s not powerful enough for a typical living room. That decision was likely made to conserve power when the light is running off the battery, but it would be far more useful to have a brighter bulb when operating on A/C, and have a switch that lets you set the desired brightness when running off the battery. Some users may want 1000 lumens of light, but only need it for 15 minutes. Others might want a dim 200 lumens of emergency lighting, but want it to run all day. By giving users 600 lumens for three hours, the utility of the bulb is a bit more limited than it should be. « RIP, Windows Phone. Your demise could lead Microsoft to redemption.